Inventory We are a resale marketplace, not a box office or venue. Ticket prices may exceed face value. This site is not owned by Denny Sanford Premier Center . The Denny Sanford Premier Center is opened in 2014 as the prime facility for all family shows and concerts in the Sioux Falls, South Dakota area. The arena has a seating capacity of 12,000 and was built for $115 million. 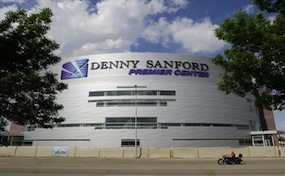 The Denny Sanford Premier Center box office is located at 1201 North West Avenue in downtown Sioux Falls, South Dakota. Denny Sanford Premier Center tickets are have included acts like Paul McCarntey, Cher, Jason Aldean, and Disney On Ice. A replacement for the Sioux Falls Arena was the popular topic of discussion for years before the final decision to replace it with the Denny Sanford Premier Center. The original venue was built in 1961 when the population was a mere 65,000, but by the year 2000 the population had nearly doubled to 124,000. By a vote of 23,284 to 16,807, the residents of Sioux Falls opted to allow the design and construction of a new events arena. It is currently the largest venue in South Dakota, eclipsing the Rushmore Plaza Civic Center by nearly 1,000 seats. PremierCenterSiouxFalls.com is not currently affiliated with any primary box office, venue, official website or supplier. We are an independently owned and operated website that operates solely in the online resale secondary market. Prices on our site tend to be above face value but can fluctuate quickly with demand. To order tickets to all Denny Sanford Premier Center Sioux Falls events please follow the steps online through checkout or call our friendly operators at anytime.